Generally speaking, Flue or Stack gas is the exhaust gas resulting from any source of combustion. Typical commercial sources of these gases are ovens, furnaces, boilers or steam generators and power plants. The need to accurately monitor, measure and report on the exhaust from commercial combustion systems is increasingly required by environmental regulations and the resulting company policies. The need to do this reliably, and at the same time economically, can be a challenge unless the correct instrumentation is used. The composition of flue or stack gas depends on the type of fuel that is being burned, but nitrogen (N2) derived from the combustion air is typically at least two-thirds of gas mixture, with carbon dioxide (CO2), water vapor (H2O) and excess oxygen (O2) making up the balance. The exhaust gas from even well-designed combustion systems will also contain a small percentage of a number of pollutants such as particulate matter (soot), carbon monoxide (CO), nitrogen oxides (NOx), and sulfur oxides (SO2). Typical ranges of these components for a gas-fired system are 74% N2, 7% CO2, 15% H2O, 4% O2, 200-300 ppm CO and 60-70 ppm NOx. For a coal-fired system they are 77% N2, 13% CO2, 6% H2O, 4% O2, 50 ppm CO, 420 ppm NOx and 420 ppm SO2. The gases inside the stacks are much hotter — and therefore less dense — than the air outside of the stack. This difference in pressure is the driving force that “pulls” the required combustion air into the combustion zone and then moves the flue gas up and out of the stack. This movement of combustion air and flue gas is commonly referred to as the "natural draft" or "stack effect" though other terms are also used. Taller stacks produce more draft and the stacks for industrial applications can be quite large to facilitate both the intake of air for combustion as well as the dispersal of the flue gases over a wide area. The dispersal of the flue gas is necessary to reduce the overall concentrations of pollutants to acceptable levels in the surrounding atmosphere. 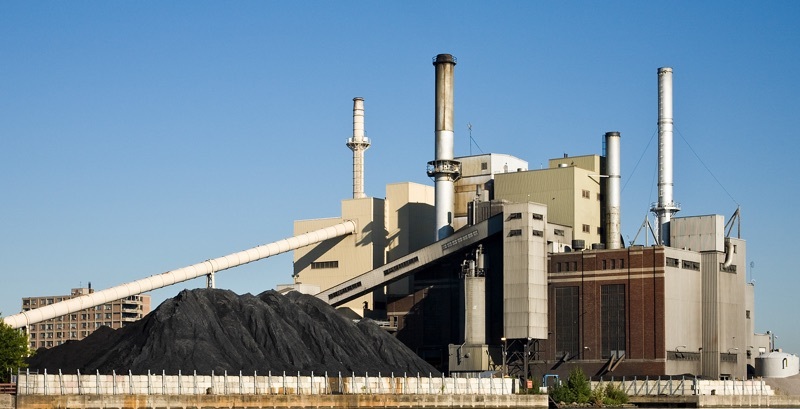 Continuous emission monitoring systems (CEMS) have been used for quite some time as a means to provide information for industrial combustion controls. To accomplish this, the systems monitored the flue gas for O2, CO and CO2. This basic function has been expanded in recent years to incorporate compliance with governmental regulations for air emission standards. In addition to the “traditional” gases, a CEMS that is used for environmental reporting now monitors emissions of SO2, NOx, mercury (Hg) and hydrogen chloride (HCL) as well as airborne particulate matter and volatile organic compounds (VOCs). The most common methods of sampling, analyzing and reporting used by the CEMS are dilution-extractive systems, extractive systems and in situ systems, with dilution-extractive systems being the most common. In conjunction with the gas sampling, the overall gas flow rate must also be measured and accurately reported to get a complete understanding of the combustion process and the resulting stack emissions. However, measuring the flow rate in large stacks presents its own set of challenges. Uneven, irregular flow profiles across the large stack diameters are more common than not, and must be dealt with adequately to achieve the necessary accuracy in the overall flow measurement. The large diameters of these stacks make most common methods of flow measurement impractical, ineffective or prohibitively expensive. What is required to meet this challenge is an effective measurement technology in an instrumentation package with low operating costs and a variety of installation options. Constant temperature thermal mass flow meters, such as those produced by EPI, operate on the principle of thermal dispersion or heat loss from a heated Resistance Temperature Detector (RTD) to the flowing gas. Two active RTD sensors are operated in a balanced state. One acts as a temperature sensor reference; the other is the active heated sensor. Heat loss to the flowing fluid tends to unbalance the heated flow sensor and it is forced back into balance by the electronics. The effects of variations in density are virtually eliminated by molecular heat transfer and sensor temperature correction, eliminating any need for additional instrumentation to provide true mass flow measurement. Multipoint Systems are designed to measure gas flows where two or more sensing points are required due to large cross-sectional areas such as exhaust and flue stacks. The EPI Series 9000MP Multipoint Systems are installed throughout the world, providing customers with years of steady, reliable service. Coupled with Air Purge System (APS), the Series 9000MP Multipoint Systems are now well-suited to an even greater variety of industrial applications. The Series 9000MP Multipoint System includes one or more Series 9000MP Probes and a Series 9601MP System Control Panel (SCP). The probe assembly typically has two or more flow sensors mounted in a 11⁄2" OD probe shaft. The 9000MP probe’s sensors are removable for field replacement if one is damaged. Each sensor is matched to its own digital microcontroller. Communications between the probe assemblies and the SCP are transmitted via an integrated Modbus RTU network. The SCP includes its own microcontroller for system-level control and flow display. The SCP provides 0–5 VDC and 4– 20mA analog output signals. The 4–20 mA grand average output can drive up to 1200 ohms. RS232 & RS485 Modbus RTU communications are also supported for unprecedented access to the overall system, — including each individual sensor — for programmable Fail Safe operation and multiple options for flow signal recovery from a sensor failure. The optional Air Purge System (APS) supports the cleaning of the sensors in applications where particulates cause problems. The frequency and duration of the purge cycle can be controlled externally or by using the Master-TouchTM software. The system can also be set to maintain the flow rate at its current level when the purge was activated. This important option preserves the integrity of the flow rate and elapsed total data which might otherwise be compromised by the flow of the purge gas. Whether used in conjunction with a CEMS installation or as a standalone answer for accurate stack or exhaust gas measurement, the Eldridge Products, Inc. Series 9000MP Multipoint Systems are known for accurate, economical and reliable performance over many years of active service life. With addition of the integrated Modbus communications and the optional Air Purge system, the Series 9000MP gains even greater power and flexibility. For more information on Eldridge Products thermal mass flow sensors, contact Arjay Automation by visiting https://arjaynet.com or calling (800) 761-1749. Reprinted with permission from Eldridge Products, Inc. Happy Independence Day from Arjay Automation!